What an outstanding turnout today in Los Angeles. The turnout was announced at 50,000 people. That same number was announced in San Francisco, and an amazing 300,000 announced at the main event in Washington, DC! It was invigorating to see such non-violent support for peace and justice. All of my pictures have been posted here. I’ve already seen the national press say things like “thousands of protestors showed up across the country” and “pro-Bush protestors were there as well.” I have given up on the mainstream media long ago: CBS, ABC, NBC, CNN (I don’t even count Fox since they are in a whole other league). I was there, you can see my pictures. Real reporting would include things like “hundreds of thousands protested across America today” and “people are fed up with militarism and occupations.” Thankfully we still have news programs like Democracy Now!. 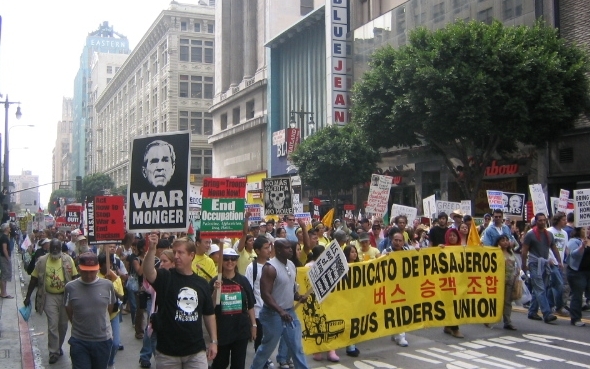 Remember to march/demonstrate/protest for peace this Saturday, September 24, 2005.